Smoking meat is the traditional and very popular method of cooking most often associated with authentic bbq. People love to use this method because of the flavor and tenderness it lends to the meat. Smoking meat involves cooking it over an indirect heat source at low temperatures for long period of time. To make wonderful smoked meats at home you may be considering purchasing a smoker. You may be feeling overwhelmed with so many available options. The most basic decision you have to make is what source of power you want your smoker to have. The most popular types are electric, propane, and charcoal. Electric smokers use electricity to power a heating element which then heats up wood and causes it to smoke. These types of smokers are great in that they allow the user complete control over the temperature and very little supervision. You can set the temperature and walk away. You don’t have to worry about running out of fuel like a propane or gas smoker. One down side to electric smokers, however, is that the replacement parts can be hard to find if it breaks down. Propane smokers work in a similar way to electric smokers. A gas-fueled flame is used to heat the wood and cause smoke. 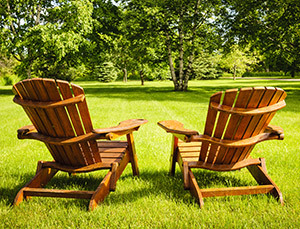 Like electric smokers, gas and propane smokers allow for greater control of the heat. You set the temperature and walk away. Propane smokers are typically portable which are great for things like camping and tailgating. 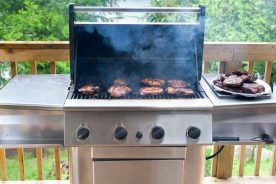 Like your gas grill, you do run the risk of running out of fuel in the middle of smoking; something so you’ll want to be sure you have enough of before you start. Propane and gas smokers are easier to fix if they break. You can find most parts at your local hardware store. Charcoal or wood smokers are what the professionals use and are considered superior when it comes to flavor. They do require more attention and can be difficult to maintain a constant temperature. Starting a fire and maintaining that fire for even cooking throughout requires some patience and definitely comes with experience. When looking for a smoker you’ll want to look for how easy it is to use. The controls should be easily accessible and easy to understand. 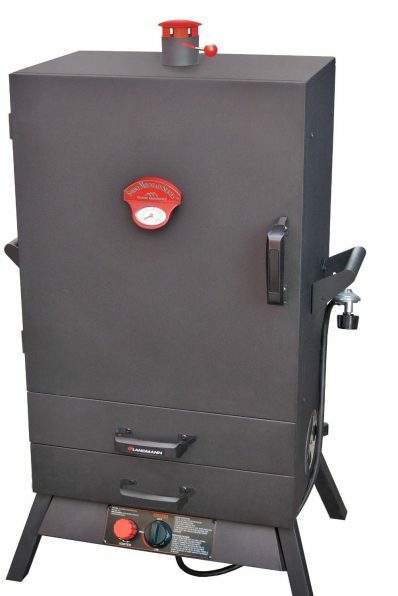 You ’ll want a smoker that is able to provide even temperature and consistent smoke. You’ll also want to make sure the size will fit your needs. We’ve looked at the best smokers that the top brands have to offer and found these eight to be the best. 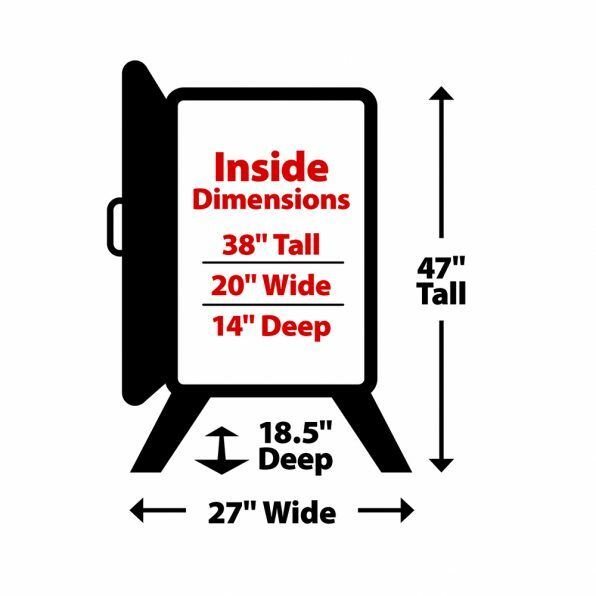 The Masterbuilt brand is known for quality and the Masterbuilt 30 stainless steel electric digital smokehouse is no different. The outer body is made from powder-coated steel and is supplied with four smoking racks that allow for plenty of space for turkey, sausage, chicken, pork, fish, vegetables, and so much more. This is an excellent smoker for beginners and masters. The electric Masterbuilt smoker makes smoking as easy as grilling. It features a simple pushbutton digital control panel which allows you to set the temperature, a range of 100 to 275 degrees Fahrenheit. By allowing you to keep a consistent temperature your food will come out exactly as expected. All food in the smoker cooks evenly thanks to the insulated walls. 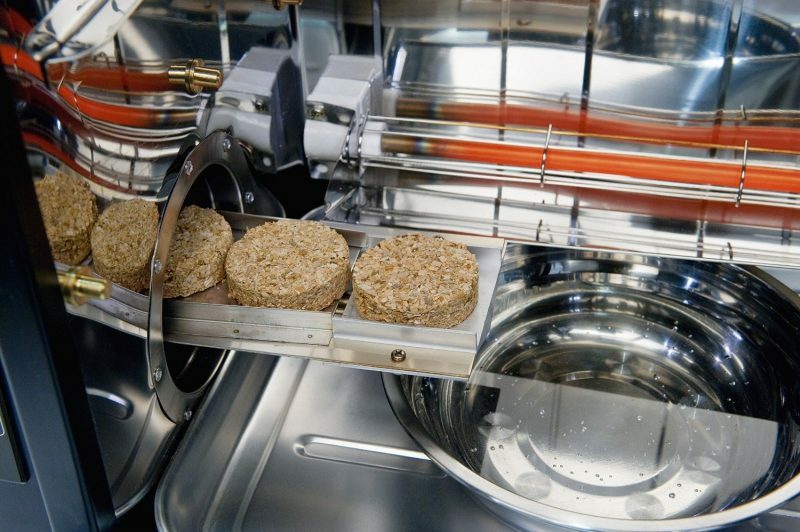 You won’t have to worry about food that is undercooked in one spot and over cooked in another. One more way to control your cooking is the timer that is built into the control panel. The timer can be set from 0-24 hours. After 24 hours the timer turns off the smoker. The smoker is 19.9 inches long, 20.4 inches wide, and 33.3 inches tall. It will easily fit on your deck, porch, or driveway. It weighs 45.1 pounds and has a cooking capacity of 1.7 cubic feet. With four chrome-coated racks that offer a combined cooking space of 730 square inches there is enough space to hold 80 pounds of food. That is plenty of space to feed the crowds for holidays, family reunions, and parties. The smoker is heated with an 800 watt heating element. Wood chips are added to the bottom to produce smoke. 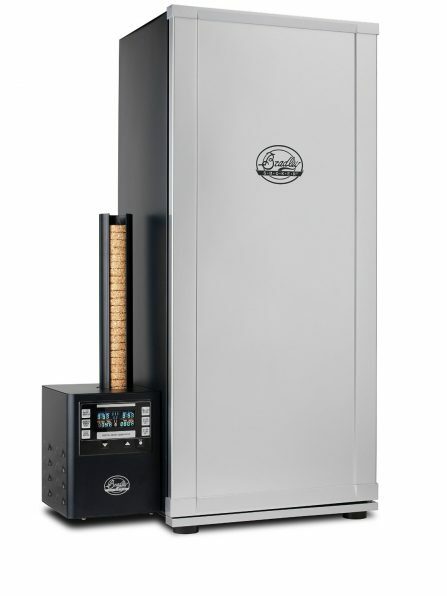 The Masterbuilt smoker features an easy-to-use side wood chip loader so you don’t need to open the door to add more. 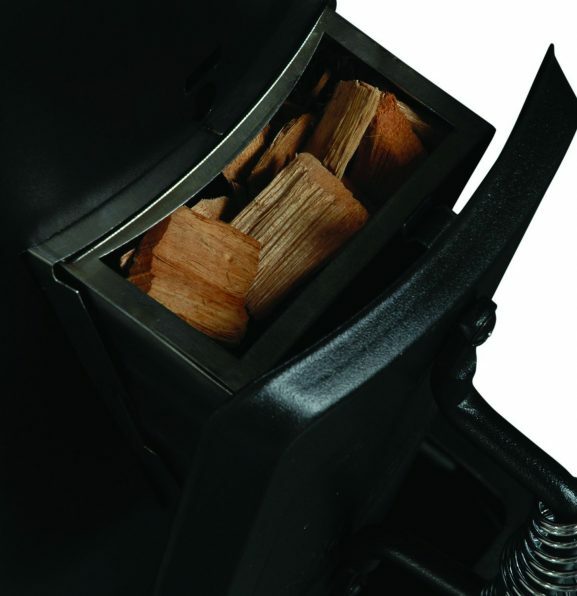 All you do is fill the loader with your favorite wood chips, slide it in, and watch it smoke. You may use dry or pre-soaked wood chips. Dry wood chips burn faster and produce more smoke. Pre-soaked (in water) wood chips do not smoke as much and burn slower. Never add more than ½ cup at a time and additional wood chips should not be added until the previous ones have burned completely. This smoker offers a removable water pan that can be used to infuse moisture and add another layer of flavor to your food. You can also add juice, vinegar, or other beverages to the water pan for added flavor. There is an adjustable air damper which you can use to increase or decrease the smoke level altering the flavor of your food. If you leave the damper closed the smoke flavor will be intensified. If you open the damper the flavor will be milder. It is recommended that the smoker be cleaned after every use. 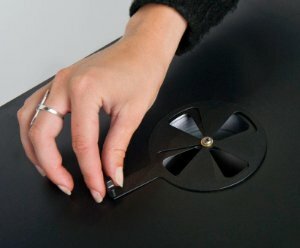 There is a removable drip pan at the bottom of the unit to catch unwanted drips and make cleaning easier. The smoker can be cleaned with a solution of 50% water and 50% apple cider vinegar. Spray the solution on and use a soft sponge. It is not recommended that you use harsh chemicals. The walls of the smoker cabinet are made from insulated steel. The insulated walls increase the energy efficiency of the smoker by keeping the heat inside rather than seeping through the sides. There is a limited, 90-day warranty against defects in material and workmanship under proper assembly, normal use, and recommended care. For questions or support please contact Masterbuilt’s Technical Support Number at 800-489-1581. You can also read more about the warranty in the manual available here. 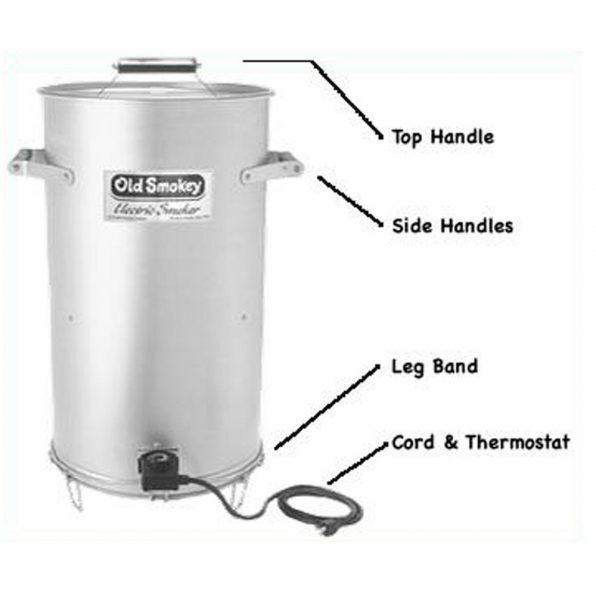 The Old Smokey Electric Smoker features a tried and true design that has been around for years. You can be sure with all this experience that you’ll get excellent results. The Old Smokey Electric Smoker produces heat with a heating element. Above the heating element is a chip tray for wood chips. There is no water tray or access door to reach the wood chips once the smoker is on. This is because the smoker is a fully sealed system which retains water and moisture. Because the lid seals tightly that means no water escapes which means your meat does not dry out and stays nice and moist. Moisture that evaporates from the meat condenses on the flat lid then drips back onto the meat. This constant, even basting provides more flavor for the food. The smoke also stays in the smoker and less wood chips are required. You only fill the chip tray at the beginning and don’t need to refill it during the cooking process. And because the heat comes from the electric heating element there is not much you need to do once the smoker is started until it ends. The temperature of the smoker is controlled by a variable heat control dial at the bottom. This allows for a variety of cooking temperatures. The maximum temperature that the 1250 watt and 120 VAC heating element can produce is 250 degrees Fahrenheit. This temperature will drop as the smoker fills with smoke and steam. There is even a ‘Keep Warm’ range if you wish to turn the temperature down as you are cooking. The dial does not allow you to set a specific temperature as a digital one does. If you choose you can purchase a separate temperature gauge which can be installed in the lid. 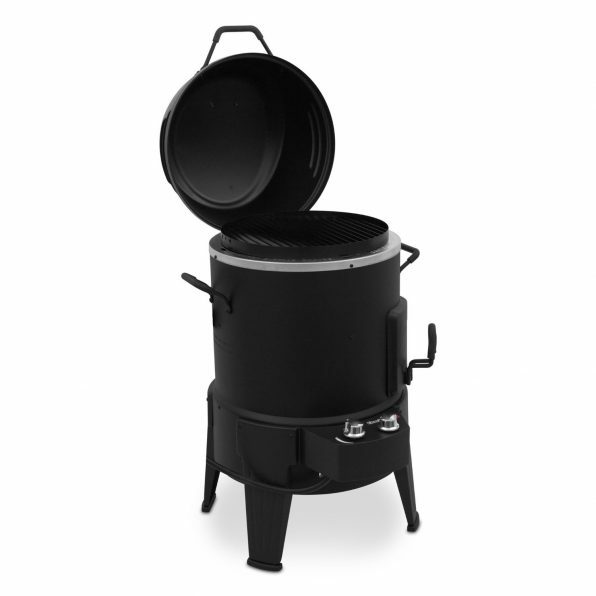 The Old Smokey Electric Smoker measures 15 inches in diameter and is 29 inches tall. 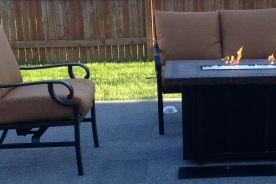 It is one the small side as smokers are concerned so it will easily fit on your deck, in your garage, or patio. There are two cooking racks. The first rack is about 14.5 inches in diameter and the lower is a bit smaller at 12.5 inches in diameter. Each cooking rack has handles to allow you to easily pull them out and put them in. A drip pan is located underneath both grills. To clean the Old Smokey Electric Smoker you simple need to turn the heat to high and let it run for a while. Take the lid off occasionally to check. You don’t need to clean the smoker every time you use it. While it is not being used it is recommended the smoker be stored with the lid off so moisture doesn’t collect inside and begin grow mildew. The smoker should be stored out of the elements, in your garage or shed for example. If you wish you can purchase a storage cover. The two cooking racks as well as the exterior of the smoker are made from corrosion-resistant aluminized steel. All parts are made in the United States. It is fairly simple in design and that means the parts are very easy to replace. 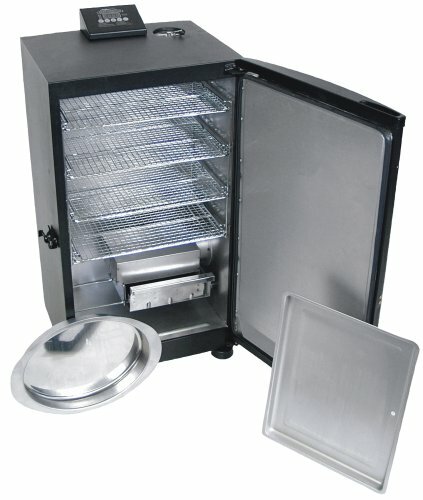 Replacement parts for the Old Smokey Electric Smoker can be found on their website. Questions about replacement parts or problems can be directed to the Old Smokey customer service. One of the downsides of this smoker is that the walls are not insulated. This means some heat can be lost from the sides. To save on energy consumption you can cover the smoker in an insulation blanket. 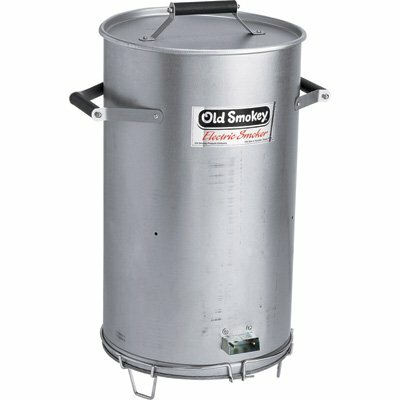 Old Smokey offers a limited warranty on its smoker covering defects in materials in workmanship. The warranty is good for one year after the date of purchase. You can also read more about the warranty available here. Smoke Hollow Smokers made by Outdoor Leisure Products boasts years of experience in cooking bbq and producing smokers. The 2-door smoker by Smoke Hollow, which runs off a propane flame, is no exception. 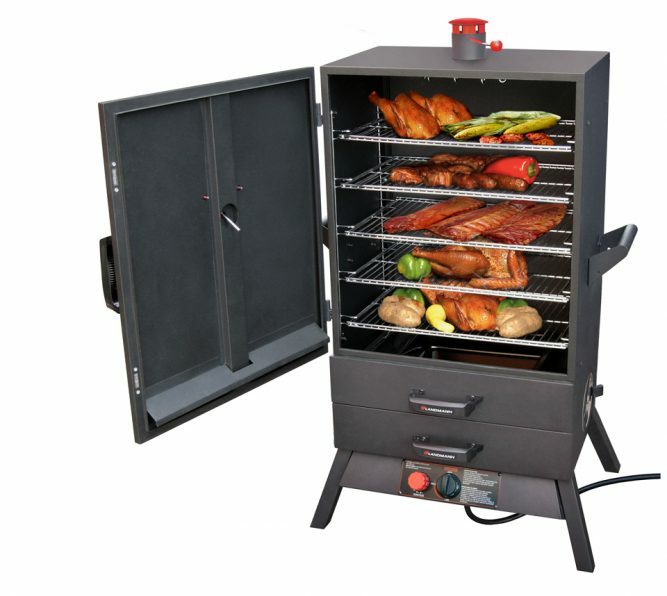 Enjoy your favorite meats cooked with this large capacity smoker. This is a great smoker for people that like feeding crowds. The propane smoke by Smoke Hollow features a unique two door system. The lower door can be used to access the water and wood pans without disturbing the food above and releasing heat and smoke. The smoker is heated by a flame at the bottom of the smoker that burns liquid propane. There is a push button to ignite the flame which makes it easy. This flame is constant and temperature is changed by making adjustments to the dampers to let air in or out so it requires a little more monitoring than other smokers. There is a thermometer on front door that indicates the internal temperature of the smoker. The upper and lower vents help to control the internal heat and moisture. The flame has an output of 20,000 BTUs which is plenty of heat to cook a whole turkey. The propane smoke is one of the larger smokers you can find. The welded steel cabinet is 38 inches tall, 27 inches wide, and 18.5 inches deep. It has an internal capacity of 3.4 cubic feet. The inside of the smoker has 4 chrome-plated grates. There is plenty of room for lots of meaty goodness. The burners are made from cast brass. The door to the cabinet has a handle made from spring wire. This handle does not get hot so you won’t have to worry about burning your hand when you open the door the check on the water pan or your food. 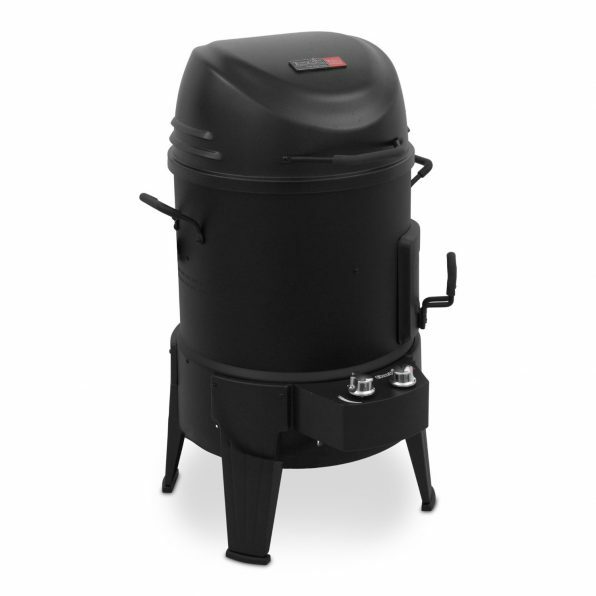 The smoker is designed to use a 20 pound liquid propane tank with the dimensions of 18 inches tall and a diameter of 12 inches. After using, the smoker is pretty easy to clean. The water bowl and grates can be cleaned with hot soapy water. These can be sprayed with cooking oil before use to make cleaning easier. You’ll want to check the hose and burners for insects and insect nests. These could lead to a fire if not removed. The inside of the cabinet can be cleaned with a damp cloth. This can also be sprayed with cooking oil before using. Check out more about cleaning in the manual available here. The cabinet of the smoker is made from steel and the grates are chrome-plated and are very durable. There are not many parts in the whole assembly, so the chances of failure is reduced. Replacement parts, unfortunately, are not available online. If you need a part replaced you can contact Smoke Hollow at 1-866-475-5180. The walls of the cabinet are not insulated so some heat from the burner are lost out the sides. To save on energy consumption you can use an insulation blanket. Regardless, this smoker is known to hold its temperature well. Smoke Hollow offers a limited warranty on all parts for one year. The water bowl is covered against defects, and the paint against defects and rust for 90 days after the date of purchase. All parts are guaranteed to be defect-free at the time of purchase. The Smokin-It Model 1 Electric Smoker is a simply designed electric smoker that gets excellent results. This smoker is best for people who want to cook like the pros in their own backyard. The portable design of the Smokin-It Electric Smoker is easy to use. 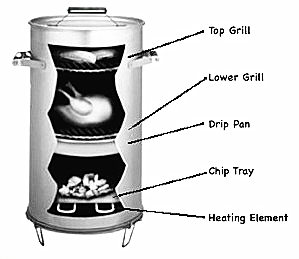 The smoker consists of a heating element which ranges from 100 to 250 degrees Fahrenheit. Temperature is controlled by using a rheostat. Above the heating element is a smoke box that holds wood chips. The wood chips should be pre-soaked as there is no water pan. The 400 watt heating element includes a LED light used to indicate when the element is on. The heating element is insulated with fiberglass to prevent heat loss. Once the smoker has started you will not need to add more wood chips or water. This is a set it and forget it appliance. The best part of the smoker is that it comes fully assembled and ready to cook. It even comes supplied with a sample of hickory wood to help season your smoker as soon as you open it. 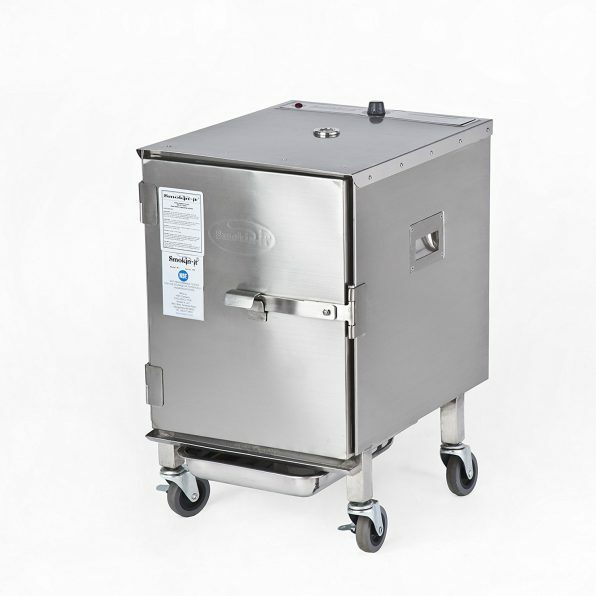 The great thing about this stainless steel smoker is that is comes with four 3-inch casters. This lends really well to the portability of the smoker. You can smoke in your driveway, backyard, or while tailgating. The cabinet itself is 15 inches wide, 19 inches deep, and 20 inches tall. The inside dimensions are 12.5 inches wide, 13.5 inches deep and 17.25 inches tall. The whole thing weighs 60 pounds so it is definitely movable. Handles are provided on the side to aid in moving the smoker. The back of the smoker features a convenient cord hanger. This is nice to keep the cord out of the way when storing the smoker. Inside the smoker you’ll find three stainless steel racks capable of holding up to 21 pounds of meat. The smoke box is located under the racks. A drip pan slides under the smoker to catch any run-away juice. Cleaning the smoker is easy. The removable shelves and wood box can be cleaned in the dishwasher. The seasoning of smoke on the interior walls does not and should not be cleaned between uses. This seasoning improves the flavor of your food. You can read more about cleaning and seasoning here in the manual. The simple design of the smoker and the durable material it is made from means it is made to last. Typically with electric smokers the heating elements are what fail first. Fortunately, this part as well as others are available on the Smokin-It website. Because this is such a basic design there is less chance for failure of parts. You can also check out the wide variety of accessories on their website such as hangers and pans. The convenient, built-in thermometer on the door measures the temperature so you don’t have to. You won’t have to open the door repeatedly to check the temperature, replace the water, or add more wood chips. This decreases the amount of wasted energy. The Smokin-It Company offers a 30-day money back guarantee for all returns in the first 30 days after the date of purchase. There is a limited warranty for the first three years that covers defects in the materials and workmanship. The Bradley Digital Electric Smoker is an outdoor barbeque smoker that gives the user full digital control over temperature, time, and smoke. 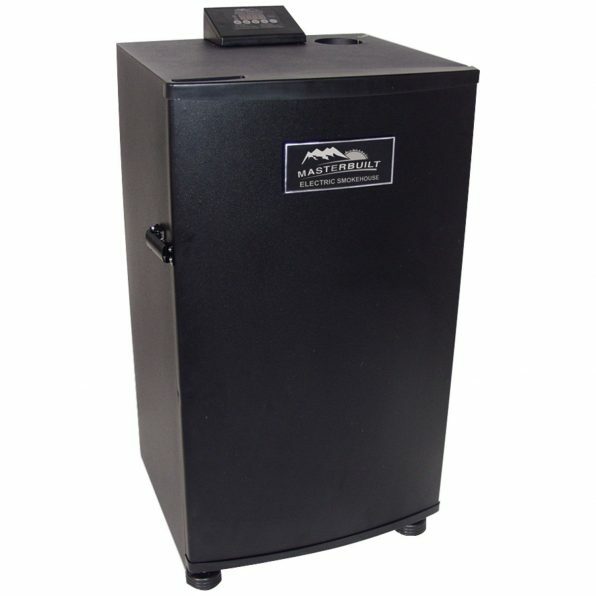 This smoker is ideal for people that like to entertain and those interested in creating gourmet food in their own home. This is a great machine to automatically roast, smoke, and barbeque in the great outdoors. The Bradley electric smoker is extremely easy to use. The smoker does all the work; all you have to do is set the temperature of the oven, the timer of the oven, and the smoke timer. There are two individual heating elements; one generates smoke and one produces heat for the oven. Because of this you are able to produce a number of different cooking options such as heat and smoke, heat without smoke, or cold smoking. This is one of the only smokers available that allows you to cold smoke items. Cold smoking is great for things like cheese or fish. 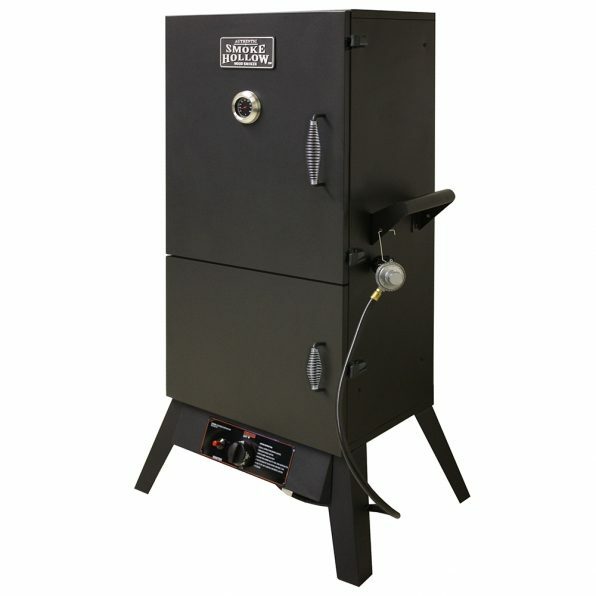 This smoker is unique in that it has an automatic feeder to advance a wood bisquettes into the smoker every 20 minutes. The dispenser is able to hold up to 8 hours worth of bisquettes. The bisquette begins to burn then is advanced into the water dish where it smolders and produces smoke. With so much automation and precision the results are consistent every time. The auto-off feature adds convenience to your smoking adventure by automatically shutting off the oven when the smoke time ends. The Bradley digital smoker features an internal thermostat to control the heat. The thermostat automatically adjusts the heat inside the oven to maintain the temperature selected on the digital control panel. The oven can reach temperatures of up to 320 degrees Fahrenheit and the smoker can produce up to 8 hours of smoke. The smoker measures 17 inches wide, 14 inches deep and 31 inches tall. It is 24 inches wide where the generator is attached. The internal volume of the smoker is 1.3 cubic feet. Inside you’ll find four removable racks; this allows better access for you food. The racks add up to 520 square inches of cooking space. There is plenty of room for meat, chicken, pork, fish and more. After each use the racks, drip trays, and drip bowls should be cleaned. They can be cleaned with hot soapy water or put in the dishwasher. The interior can be wiped with a damp cloth. The exterior of the oven is made from powdered steel. The interior is stainless steel made to hold up through the years. 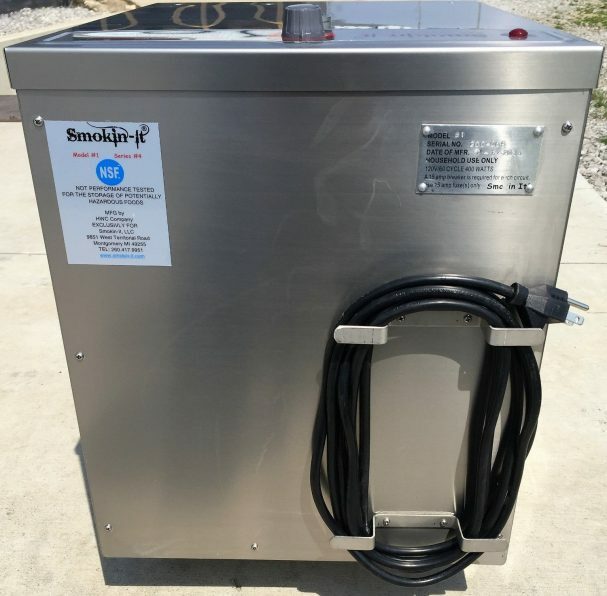 Because of the many convenient features of this smoker there are a lot of parts and more maintenance is required than compared to a more basic smoker. Replacement parts are not available online and may be more difficult to find. The insulated interior walls of the smoker are very capable of heat retention. You’ll be able to use the smoker on cold days and still maintain the desired temperature. There is a limited warranty against manufacturing defects for the first year after the date of purchase. Read more about the warranty in the manual found here. The Char-Boil Big Easy Smoker and Roaster is a great multi-tasker. You can smoker, roast, or grill with one appliance. Its fuel source is propane and uses the TRU-Infrared cooking system which keeps the heat constant with no cold or hot spots. This is a great smoker for people that don’t have space for a smoker and a grill. The Big Easy is a multi-tasker; it can roast, smoke, or grill. And it is super easy to do all of them. There are no spits for the roaster, charcoal for the smoker, or flare-ups while grilling. The Big Easy uses propane and is easy to turn with its rotary ignition; it lights quickly with the turn of a knob. The propane burner is different from other smokers that have one burner on the bottom. This specially-designed burner is fully enclosed between the outer and inner walls. The heat from the burner radiates infrared heat through the walls and penetrates and cooks your food. The heat is evenly distributed so your food is cooked evenly. Hot air escapes through the top of the chamber before it has a chance to dry your food out leaving it moist and tender. The roasting basket can hold up to 25 pounds of meat and easily lifts out of the cooker. Internally there is a smoke box which uses wood chips or pellets and does not require the use of a water bowl or dampers to control smoke. At the bottom of the cooker is a grease tray to capture drips. You can purchase custom-fit pan liners to use the drippings for gravies and sauces. Finally there is a grill top that can be used to grill hot dogs, hamburgers, steaks, wings and more. Because the heat is infrared you don’t need to worry about flare-ups while grilling which can burn your food. Traditional grills use convection, or hot air to cook food which can dry out food. The infrared system limits hot air flow and uses radiant heat to cook food directly without drying. It is able to cook food at temperatures ranging from simmer to sear without drying out food. The propane burner ranges from 9,000 to 18,000 BTUs. There is not a dial to set a specific temperature. The average cooking temperature on the highest setting is 616 degrees Fahrenheit. The temperature decreases as the knob is turned down. The external temperature will affect the cooking temperature. So if you are using it on a cold day you might not be able to reach the highest temperature. When roasting you’ll want to turn the knob to the highest setting, smoking will need to be to be on the lowest. The grill reaches an average high temperature of 576 degrees Fahrenheit. A meat thermometer is included to help determine the internal temperature of the meat as you are cooking. The Big Easy measures 18 inches deep, 24 inches wide, and 36 inches tall. It weighs 52 pounds and with the stay-cool handles it is easily portable. It is a good size for the deck, patio, or driveway. The internal roasting basket has two levels with a total of 180 square inches of cooking space. That is plenty of room to cook a 25 pound turkey. The roasting basket is also used for the grill. The roasting basket and drip try should be cleaned after every use. These can easily be cleaned with hot soapy water. The burner assembly should be taken apart and cleaned occasionally to check for blockages. You can read more about cleaning the assembly in the manual. 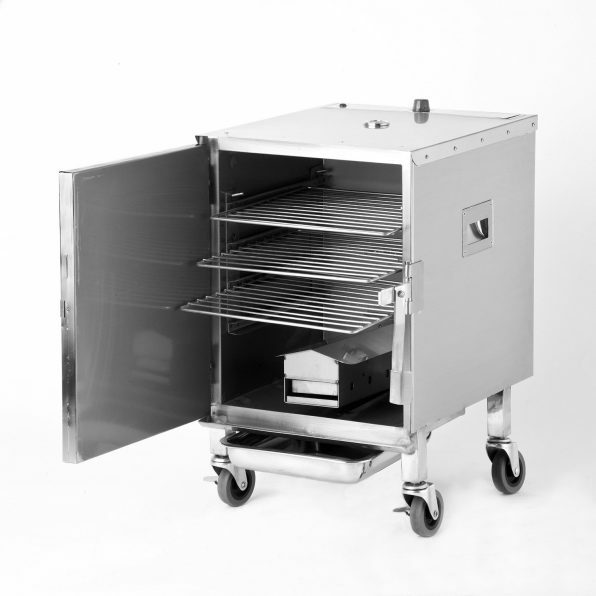 The smoker box, roasting basket and grill are made from stainless steel. The lid is porcelain coated and the cool-touch handles add to the durability and solidness of the design. Replacement parts can be found on the Char-Broil website. The design of the Big Easy is fairly efficient. Because the burner is fully enclosed not much heat is lost. There is a limited warranty that covers defects in the materials or workmanship for up to one year from the date of purchase. The Landmann Vertical Gas Smoker is a huge propane smoker that is solidly built. This is one of the best smokers in its price range. The design of the smoker is pretty simple. There is a cabinet with a propane heating element underneath. The heating element is lighted by a rotary igniter similar to one you might find on a gas grill and is easy to use. Above the heating element (and below the cabinet) are two drawers with handles to access the wood chip box and water pan. This is a great energy saving feature because you don’t have to open the main chamber to reach them. It is a little more hands on than an electric smoker, but the temperature control is well worth the trade-off. The water tray may need to be replenished occasionally as you are cooking. A full water pan will last 2-3 hours. The wood chip tray when full will typically last for several hours. Depending on how long you are cooking you may not need to refill it during one smoking. The cabinet door closes with a magnetic clasp that efficiently latches the door. The propane burner can be easily turned on using the rotary igniter. The heat is fully adjustable and a built-in thermometer on the door helps you to make adjustments. There is also an adjustable top chimney, side damper vents with plastic tab guards to help control temperature. The temperature range of the smoker is 0-250 degrees Fahrenheit. The Landman Vertical Smoker is on the large size. It is square is shape with wide stance legs for stability. It is 21 inches wide, 26 inches deep and 47 inches tall. The whole thing weighs 70 pounds. It is not a very portable machine. 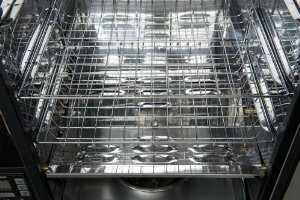 The inside of the cabinet has 5 adjustable chrome-plated grates with a combined total of 1576 square inches of cooking area to smoke your favorite meats. There are also hooks on the top of the smoker to hang meats. Below the grates are two drawers. The top drawer holds the porcelain-coated steel water pan and the bottom drawer holds the heavy duty steel wood chip box with a lid. The inside of the smoker is easily cleaned with a damp cloth. The water pan, chip pan, and grates can be cleaned with hot, soapy water. These items may be sprayed with cooking spray before cooking to make it easier to clean after use. 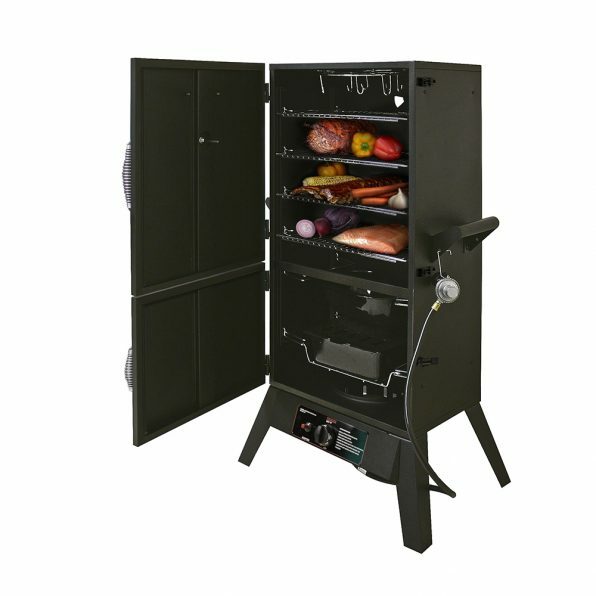 The cabinet of the smoker is made from heavy-duty steel made to last and is easily assembled. The burner is made from durable, cast brass with an intended long life. It will not rust. The water pan and chip pan are made from steel with the water pan being coated in porcelain for extra protection. These are all high-quality materials that are durable and will last for many years. Replacement parts are not readily available. 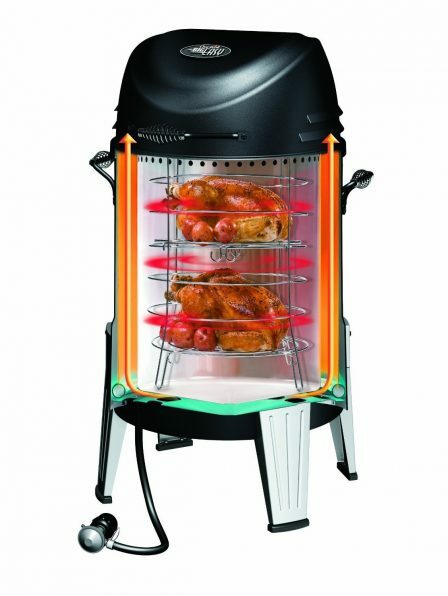 There are many features of this smoker which increase the energy efficiency of the appliance. The water pan and wood chip box are accessed through the bottom drawer without the need to open the cabinet door. This saves a lot of heat and smoke being used to cook your food. The heavy-duty cabinet sides also offers some protection against heat loss. 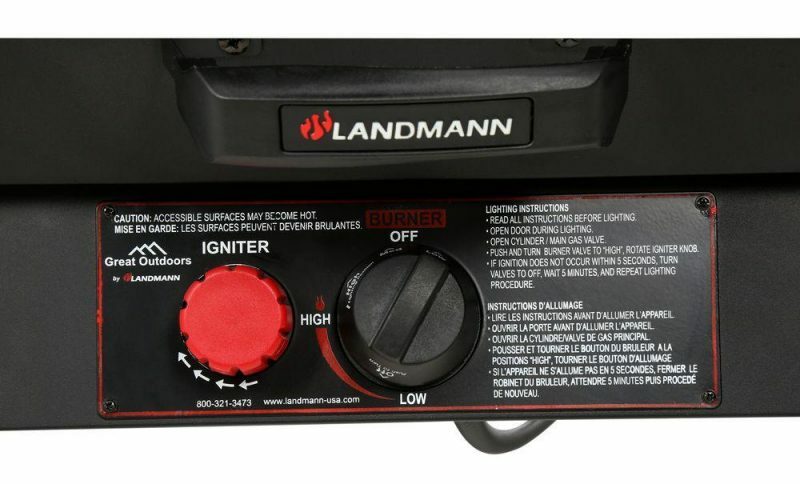 Landmann offers a limited warranty. The cast brass burner is guaranteed against defects or broken parts for 10 years. The water bowl is covered against defects for 90 days after the date of purchase. All other parts are covered for 1 year after the date of purchase. Read more about the warranty in the manual found here. 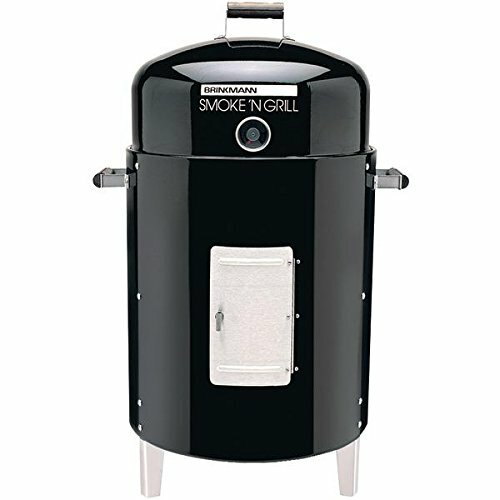 If you are looking for a charcoal smoker that is inexpensive and on the small side the Brinkmann Smoke-n-Grill Charcoal Smoker and Grill is the one for you. Brinkmann smokers are one of the best brands of wood meat smokers. It is a great smoker for beginners. But don’t let its size scare you. 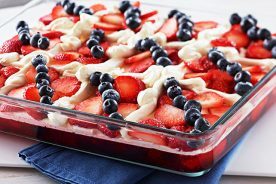 It has a large enough capacity to feed a crowd with room leftover to smoke or grill the veggies and sides. This simple smoker with a classic design is easy to use, but does require some monitoring during the cooking process. The charcoal is lighted and added to the bottom charcoal pan. Wood chips are added to the charcoal for smoke. Above the charcoal/chip pan is the water tray. This water tray acts as a barrier to the meat so the heat from the charcoal does not directly cook your meat. There is no drip pan so drippings from the meat fall into the water pan. The water in the pan can be flavored with juice, lemon slices, or marinade to add more flavor to your meat. A full water pan will last for 2-3 hours. The two grates are covered with a domed hood so there is plenty of room on the top grate for food. The door on the front of the smoker opens to allow access to the charcoal pan and the water pan. The water bowl is a little in the way so this makes the process a little difficult. A full pan of charcoal should burn for about 5-6 hours depending on the weather. The smoker can also be used as a charcoal grill. This is convenient for people that are short of space and don’t have room for a grill and smoker. If you wish to use the grill you would remove the domed lid and place the charcoal pan on the bottom grate. The food would cook on the top grate. Read more about the different ways to smoke and grill in the manual found here. Because this smoker use charcoal for its heat source it does not have a direct way to control temperature. 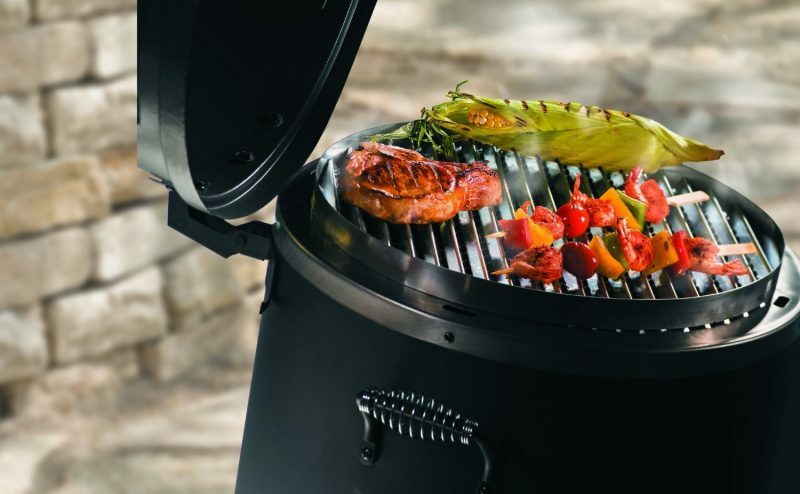 The grill comes with an easy-to-read internal temperature gauge that is mounted in the domed hood. The Brinkmann Smoker is small in size compared to most. It measure 17 inches in diameter and 32 inches tall. Despite its smaller size it is able to smoke up to 50 pounds of meat at one time. Which is great if you have a lot of people to feed. Inside the smoker you’ll find the steel charcoal pan and the porcelain-coated steel water pan above it. Above the water pan is two chrome-plated steel grates. The cooking grates measure 15.5 inches in diameter with a combined total of 375 square inches of cooking space. The doomed lid gives you plenty of room on the top grate. Cleaning the smoker is pretty easy. The grates, charcoal pan, and water pan can be cleaned with hot soapy water. Spray cooking oil on these parts before cooking to make clean up easier. The inside of the smoker can be cleaned with a damp cloth. The body of the smoker is made from steel. It has a protective paint coating but the exterior may rust over time. The best way to prevent rust is to keep the smoker covered when it is not in use. The water and charcoal pans are made from steel and are pretty durable. The legs of the smoker are aluminum and will not rust. The handles are wood which are heat-resistant as well as durable. Because the smoker is fairly basic in design there are not many parts to it and it has a lower chance of anything breaking. Replacement parts and accessories are sold by Brinkmann. You may contact 1-800-468-5252 for more information. The body of the smoker is not insulated and may leak heat. If you are using the smoker on cold days it may be difficult to keep a higher temperature inside the smoker. Brinkmann offers a limited one year warranty after the date of purchase against defects in the materials and workmanship.